Table Football - Rainbow, a unique all weather waterproof outdoor table football table with glass top. The Rainbow table football table with optional coin mechanism and hinged lid for extra storage capacity inside. Stainless steel bolts, zinc coated and resin treated legs and corners, a furnace toughened glass playing field and a specially treated wooden framework ensure the table will withstand the elements all year round. The Chatsworth summerhouse 1.83x3.05m traditional style with many options available including a verandah. The Rome Cabin features strong 94mm Logs and a unique Pyramid roof. Size 500 x 500cm (16'4 x 16'4). Windsor summerhouse 4.27 x 3.66m a square building with lots of options available. 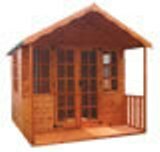 Gorbea log cabin measuring 5x5.90m manufactured from 68mm logs includes attractive terrace perfect for relaxing under.